We are back in humid St Louis and the garden and flowers are looking great thanks to our neighbours watering skills. I planted garlic way back in October last year and I harvested this weekend. It is now drying in the basement. I am fairly sure I will be roasting some sooner rather than later. So far we have dug all of the garlic, some turnips and the snap peas and snow peas are wonderfully ongoing. I love to have a big mint patch and a healthy parsley plant, so that I can make mint tea and add the herbs to salad. My basil is doing well, in fact I think I feel home-made pizza in the air! Even the cucumber plant has itsy bitsy cucumbers growing. We are going to have lots of turnips, but I really don’t know what to do with them! Mash them with potatoes or add to a stir fry. I did see a recipe for turnip crisps which I may try. I will let you know how they turn out. Do you have any turnip recipes for me? 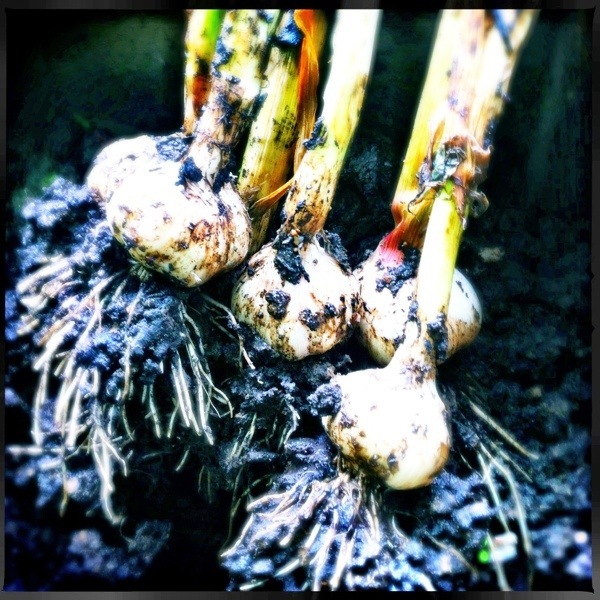 Garlic right out of the ground.